The very end of sunrise over Connery Pond with a submerged maple leaf in the foreground. 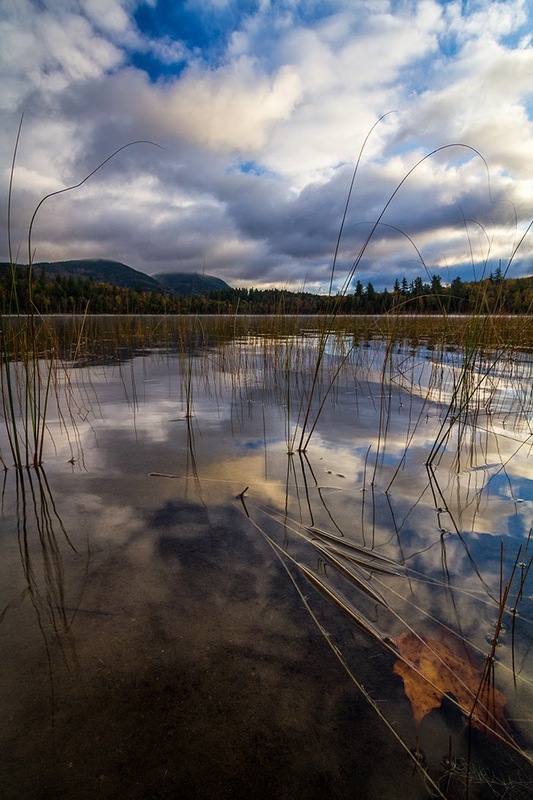 Here are a few last (maybe) images from the Adirondacks. It was an amazing trip. Thanks for all the kind comments, likes, and shares on the images/blog and I hope you've enjoyed the series. I've included one last one from Connery Pond, on a morning when the fog wasn't too dense, but we didn't get much of a sunrise anyways, until the last moment. I've also included a daytime panorama of the old Keene Barn and the wonderful view beyond it. To create this image I stitched 14 vertical images together. Each of those images was a 32bit HDR image made from three shots bracketed at +/-1 stop. Have a great weekend! The old Keene Barn and view to the peaks beyond near sunset.